Peter Pagitz was born into a family of Austrian industrialists. He grew up in his native town of Klagenfurt (Carinthia), where he worked in an executive position in his parents’ business for several years after graduating from upper secondary school. He then decided to move to Vienna and study international commerce at the University of Economics. After graduating from university and earning the academic degree “Diplomkaufmann” (Dkfm. ), he opted for a career in consulting and became a public accountant. 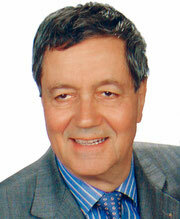 Having successfully completed the related exams in 1972, he joined the Chamber of Public Accountants in Vienna. He did internships in Paris and Moscow. As a public accountant, Peter Pagitz mainly works in the international arena, also thanks to the fact that he is a multilingual person with an excellent command of Italian and English in addition to his native language German. He has been a sworn and certified court expert and a member of the Expert Committee for Company Law and Auditing of the Chamber of Public Accountants in Vienna since 1999. Peter Pagitz’s contacts include internationally renowned and trustworthy private equity groups and providers of cross-border financing.